With advances in media technology, time spent at home with family and friends often centers on watching a movie or sports event and “cocooning”, especially on a cold winter night. 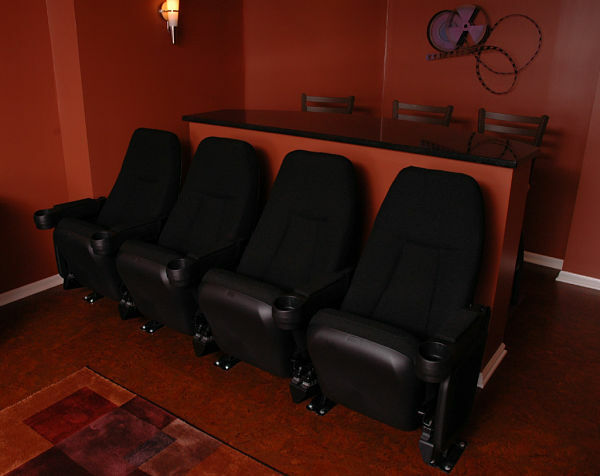 Basements can provide extra informal living space for TV viewing and relaxation, and have risen to a new level in today’s homes: The Basement Home Theater. 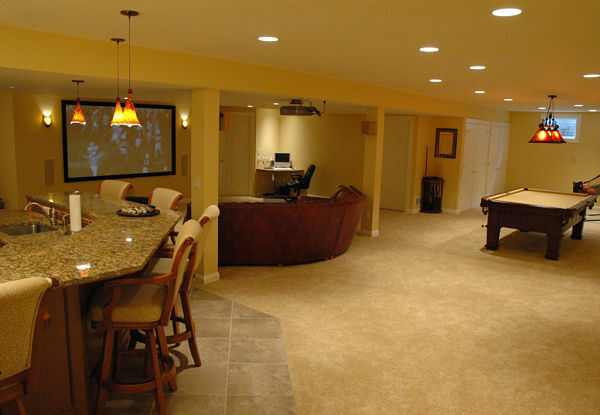 If you’re considering a basement remodel and want to add new home media equipment, here are some great design ideas from “over-the-top” to the traditional cozy family gathering space. So sit back, dim the lights, roll the film, our feature presentation is about to begin. A basement can have all of the amenities of a commercial cinema just a few steps away from the primary level of your home. The optimal theater design has dimmable lighting and no natural light to shade out. Dimmable lights on walls provide a point of reference when the room is darkened for movie viewing. These homeowners wanted to create a comfortable space for viewing movies with family and friends. They had an area of their basement with no windows that could be enclosed with doors. Dimmable lighting, dark red walls, black cinema-style seating and a snack bar for refreshments set the mood. A giant screen television takes center stage and is framed by custom cabinets designed to hide wires, camouflage speakers and store videos. 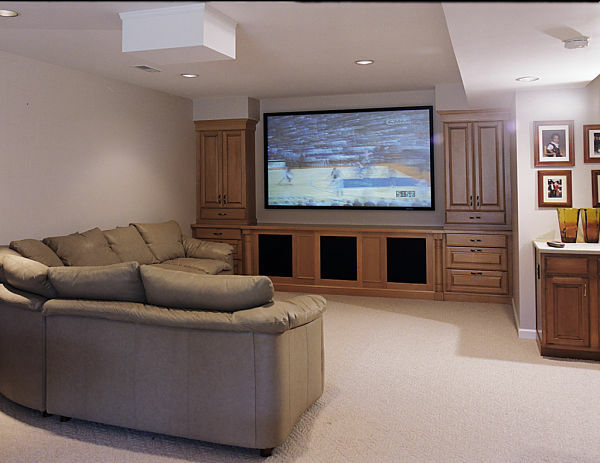 If sports night is more important in your home than movie night, a lower level can be transformed into a “Sports Center” to host “the Big Game”. What sports fan wouldn’t love a projection screen to view the game, a nearby computer to check scores, a sports bar for “arm-chair quarterbacks” and a place to shoot some hoops or cue up for a game of pool at half time? Traditional family rooms remain popular among homeowners. There is nothing like a bright, uncluttered media room designed for comfort and relaxation with a giant screen television, warm carpeting, an oversized chair and loveseat to watch a show or game. 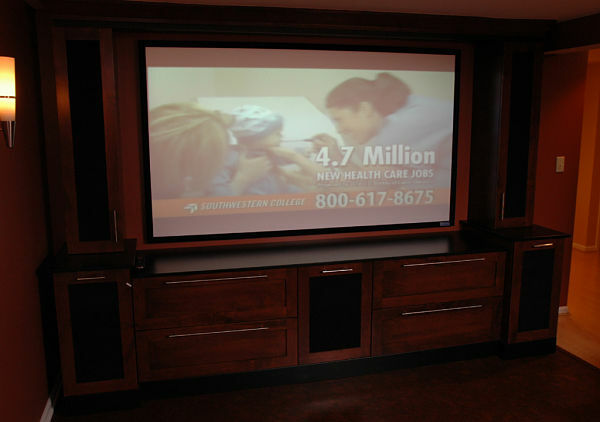 Front projector screens have become more affordable and provide a true-to-life theater experience at home. The television comes in two pieces: a projector, which requires front mounting, and the screen, which can range from 70 to 120 inches diagonally. Sound is provided by multiple speakers. Some projector screens are fixed frame wall mounted units while others may be manual or electric operated pull-down screens. From a design perspective, the challenge is where to place the projector and how to integrate the large screen and speaker components into a room. A projector placed on a ceiling enclosed in a custom shelf can blend into a room. Cabinets designed to camouflage wires and mount speakers can also provide storage for cable boxes and DVDs. As media equipment becomes more refined and versatile, many of us are faced with questions about where to place screens for optimal viewing and how to hide wires and cable. 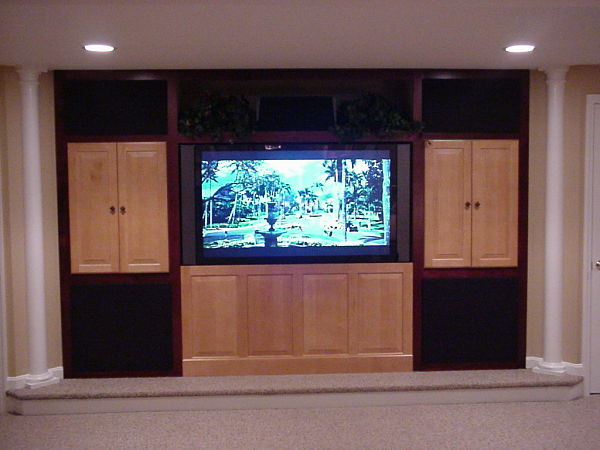 Custom or semi-custom cabinets are an essential element for media rooms. Common problems such positioning a TV at a height and angle for optimal viewing and positioning speakers can be solved with a multi-cabinet and drawer custom entertainment center. 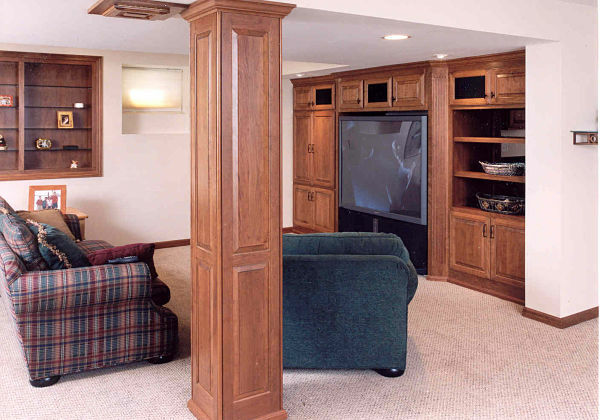 The custom cabinets for this entertainment center were designed for a big screen television and speaker components. 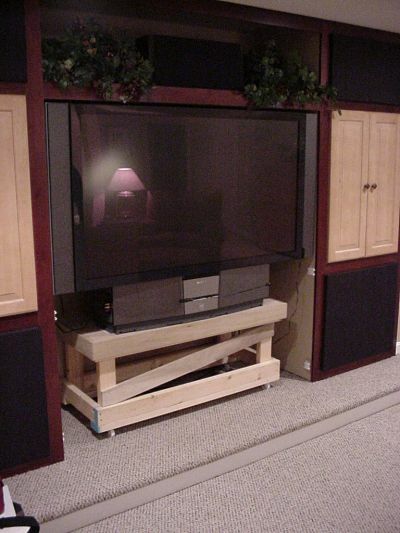 A custom base was built to support the television and raise it to the proper viewing height. A front panel covers the base and can be removed for adjustments and repairs to the television.